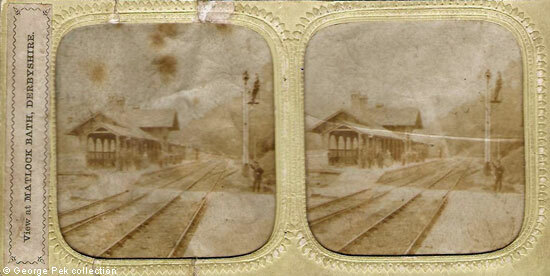 This is a hold-to-light tissue stereographic photo of Matlock Bath's railway station (train station) and has to be one of the earliest photographic images of the station site. There are nine passengers on the platform awaiting a train; six are men and three are women, one of whom is wearing a crinoline. Two railway workers are on the right. One of them is standing on the ground but the other is on the signal itself. He has climbed up the steps to a small platform but, as no arm is visible, he was either maintaining the lamp at the top of the post or was building the signal. The control cable is already in place on the post. Further along, towards the High Tor Tunnel, is a second signal (look above the head of the railwayman who is standing on the ground). What is curious is the "down" track as there seems to be another track joining it. Neither the "down" platform nor the passenger footbridge, seen in the next image, were built when this photograph was taken and the platform must have been built over this track. There is always an element of surprise with hold-to-light tissue stereographic photos and this one is no exception. The image below is what is seen when one holds the picture up to the light. 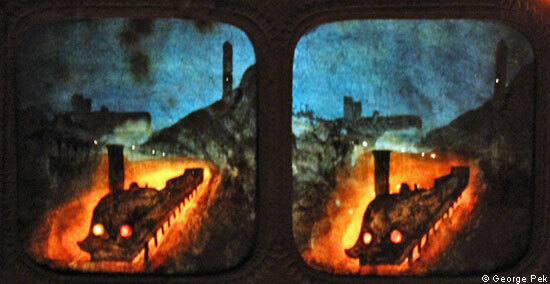 So instead of a daytime shot of the station we see a train driving through Matlock Bath at night, bathed in the orange and red glow from the engine's fire. What looks like a tower will be the signal post. Hold-to-light tissue stereographic photo in the collection of and provided by and © George Pek. Date originally given as 1859-62. Revised to 1860, with thanks to Ken Smith. Believed to have been published by the London Stereoscopic Company though does not have the London Stereoscopic Company blind stamp. See: London Stereoscopic Company Reborn! (External site) You will need to scroll down.